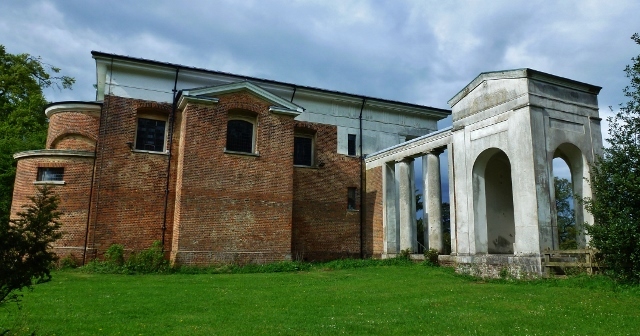 Commissioned by Sir Lionel Lyde around 1775 and built in 1778, the church in a field in Ayot St Lawrence, some 8 miles north of St Albans, and only around 25 miles north of central London, was designed by Nicholas Revett; this Suffolk gentleman architect was clearly passionate about classical buildings. Together with James Stuart, he published several volumes of detailed drawings of classical buildings in Greece and elsewhere in the Eastern Mediterranean, having travelled extensively on a "Grand Tour" for his research. 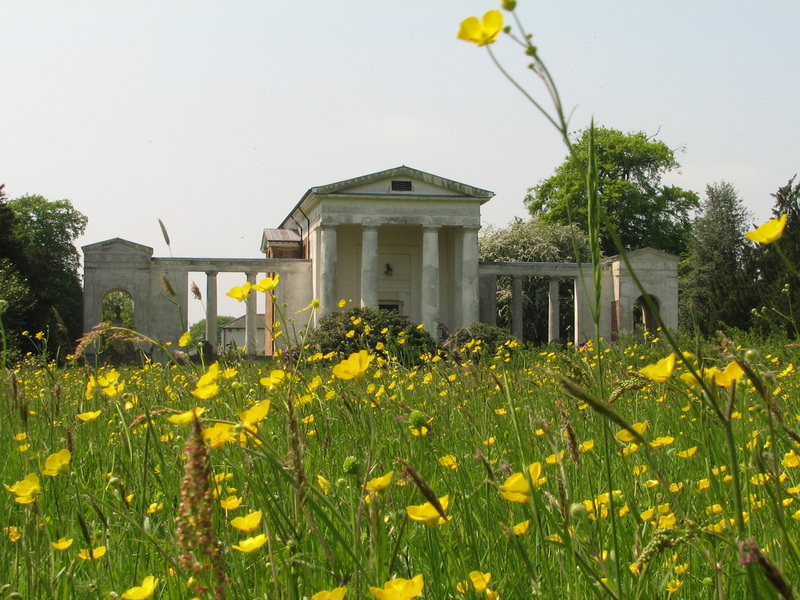 St Lawrence church is loosely modelled on the columns found in the temple to Apollo on the island of Delos, in the Cyclades - and so is, in fact, an early example of the Greek Revival style and not "Palladian", as it is generally - and erroneously - called. 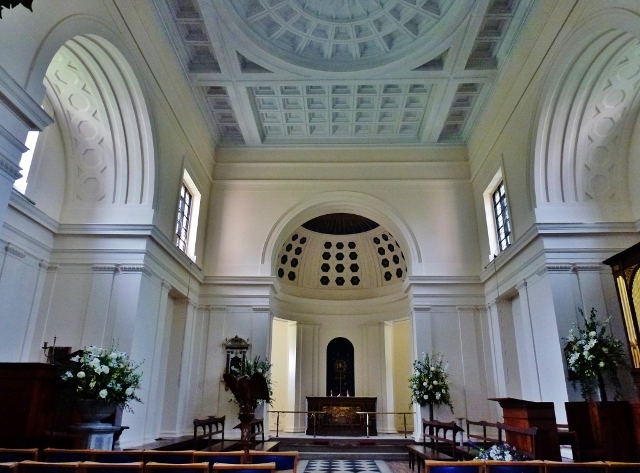 ​The church has its Grade 1 listing as a result of its "Greek Revival" style, but following a most enlightening talk from Jason Kelly, Professor of British History at the University of Indiana and an expert on the Georgian period and the Society of Dilettanti, we should probably be referring to it as "Grecian". 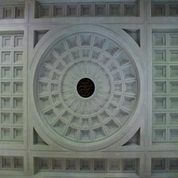 (The difference is to do with the emphasis on maintaining very precise measurements in the Greek Revival style, which Revett, in practice, did not observe in his buildings.) 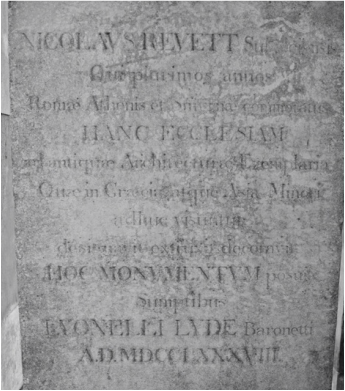 Do look at the images below for a picture of the (recently cleaned) inscription on one of the plinths, above Sir Lionel's tomb: it is a form of eulogy to Nicholas Revett! 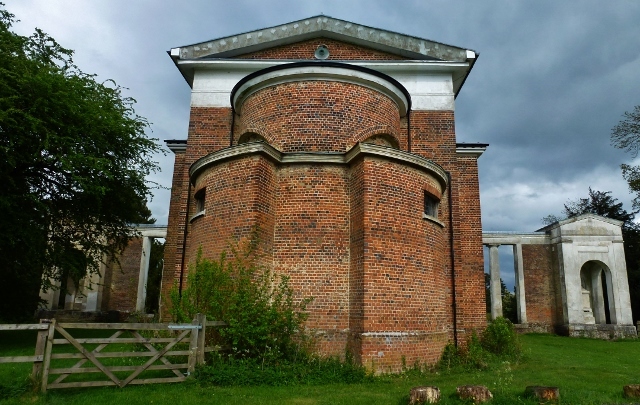 The church as originally built did not look like the picture above (thanks to Chris Dowsett for this stunning image); Carola Oman's book, "Ayot Rectory", includes a sketch by H.G. Oldfield, from Volume 1 of his "Views of Hertfordshire", showing the additional feature of "tempiettes" above each lateral pavilion. 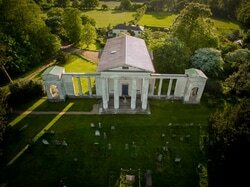 Until very recently I was unsure if it was actually built like this; the triglyphs also do not run right across the front of the church as pictured by Oldfield. .Recently, however, I came across a sketch by Thomas Clutterbuck, apparently from 1807, which does show the church looking like the Oldfield image; given that this sketch is more naturalistic, we can assume that the original building did indeed look like this! The reference in the circular towers is, we believe, to the Choragic Monument of Lysicrates, in Athens, and was a frequent source of inspiration to neo-classical architects. For copyright reasons I am not including either of these sketches here but hopefully both will be in the new guidebook that is being written and will be available in 2019. 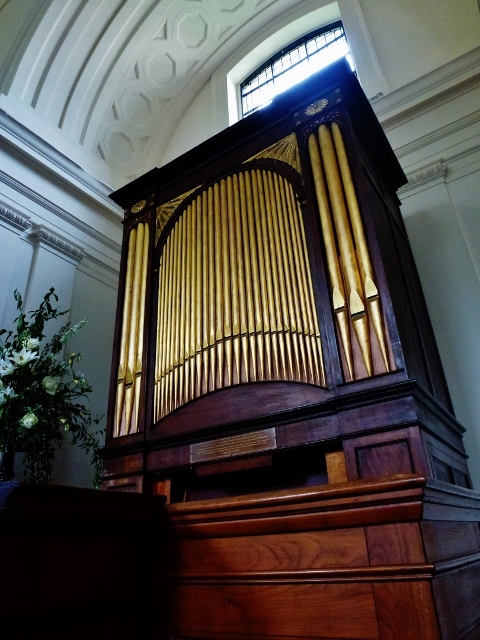 The church was built in parkland belonging to Sir Lyonel and was orientated in reverse to the normal church building rules: the front door faces Ayot House, his home, which means that the altar is at the west end of the church, rather than the liturgically correct east end. This main door was intended for the use of the Lyde family and invitees; villagers entered through a door, bricked up many years ago, in the north side (to the right of the image above). We have recently re-opened this door as it now forms the entrance to our newly constructed loo and kitchenette, housed in a small extension, tucked behind the original solid panels immediately adjacent to the main body of the building. Sir Lionel intended the church to serve both as a village church and as a mausoleum to his wife and himself. Sadly their marital life was not happy and so he decreed in his will that "what the church united in life, let it keep separate in death". Hence the pavilions at either side of the main church structure house, to the north, Sir Lionel's remains and, to the south, those of his wife. The children's programme "All over the Place Europe" created and recorded an amusing song about this back in 2012: it's a little tricky to find on the BBC site (no links, sorry) but if you search CBBC under "All over the Place Europe" with "Ayot St Lawrence" you'll find it. Good shots of the church exterior, Ayot House, (with Bertie (RIP October 2018) the labrador who, apparently, kept appearing in the shot much to the annoyance of the crew) and the Ruins. 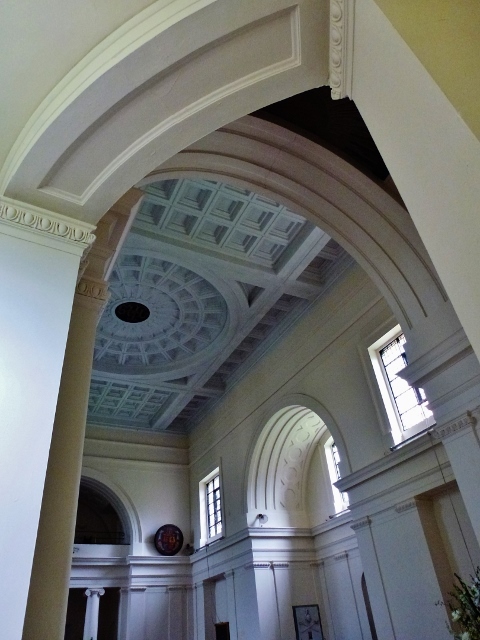 See our blog page for the work we are starting to do as we discover the links to the slave trade embedded in this church. Do contact us with any information on this point: it is likely that the Lyde family traded in slaves as part of their commerce in The Caribbean for tobacco/sugar, as did many in the gentry, who would not have seen anything remiss at all. In the Ruined church in the village, we have the grave of Charles Ashwell whose residence is given as Grenada. 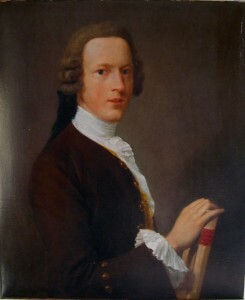 He was also mentioned in a special Act of Parliament, debated in 1806, in connection with his trade with Grenada and St Vincent. As we ponder this, and the apparent lack of church opprobrium, we do have to remind ourselves of the continued existence of slavery, perhaps today known as human trafficking or even below minimum wage labour. See the link to the antislavery website below: nothing historical here! More on this to follow.. Many photos on this page are kindly provided by © Stiffleaf Photography. Please respect the copyright.